Go tell Alice... has an excellent PA system and Steve's years of experience as a roadie and sound technician means that he can set the sound to suite your venue. Easy on the ear where people want to eat and relax or loud and lively enough to get you dancing without deafening the bar staff or making conversation totally impossible. Steve studied at Dartington College, has worked with many top bands and performers, including Billy Bragg, and has played at all the major festivals. He and Lizzie have been playing together for the past 5 years. Musical influences range from Madness to John Martyn, from Miles Davis to Mumford and Sons. This gives the duo it's engaging and sophisticated playing style with a very wide range of covers and original material. Click on the picture below to see if we are available for your event. 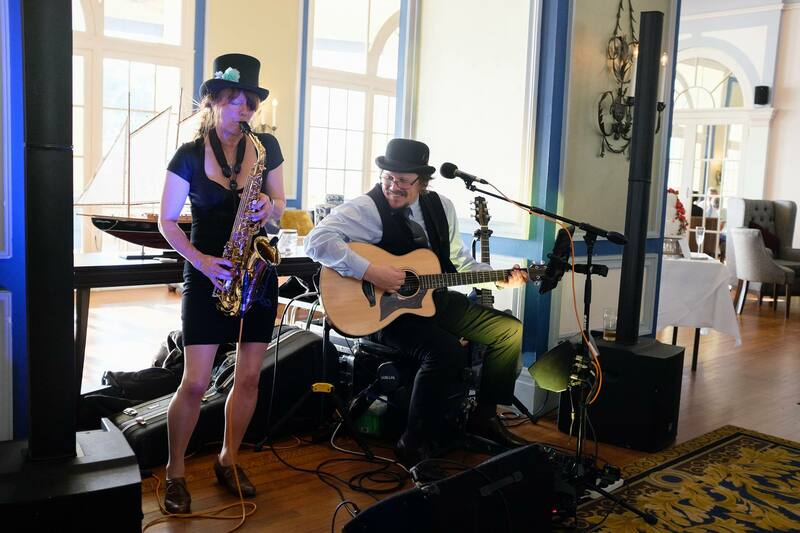 "Go tell Alice have a smooth combination of saxophone, guitar and vocals, delivering a lively and exciting mix of original material and well chosen covers, with a funky blues, jazz twist. This interesting an unconventional little duo create a full, rich sound, so dance, laugh and enjoy."